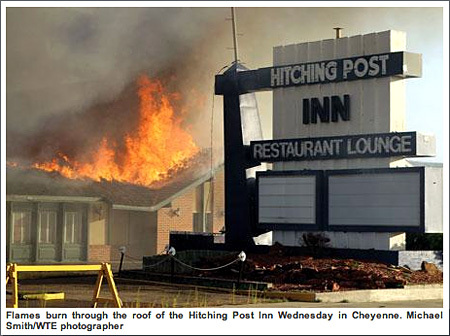 A beloved Lincoln Highway landmark, the Hitching Post in Cheyenne, Wyoming, has been destroyed by fire. Various newspapers covered the fire and aftermath, including an initial story by the Caspar Star Tribune. The Hitch, as it is fondly known, started out as a small motor hotel called the Lincoln Court. Pete Smith opened it in 1927…. In 1946, the Lincoln Court became a charter member of Best Western International. In 1948, the family opened a restaurant at the hotel called the Hitching Post. As more and more rooms were added, the name stuck. My family stayed at the Lincoln Court about 5 years ago, by then a wonderful mid-century motel, but that older portion had recently been demolished. The remaining and much larger Hitching Post maintained an Old West decor. The city called in an ATF team of about two dozen agents to help with the investigation, and the blaze was just ruled arson but the investigation is ongoing. Most comments to articles are overwhelmingly nostalgic for what has been lost, with only a few voicing a need for modern retail there. Thanks to loungelistener for the tip. This entry was posted on September 22, 2010 at 11:10 am and is filed under highways, history, Lincoln Highway, lodging, signs, travel. You can follow any responses to this entry through the RSS 2.0 feed. You can leave a response, or trackback from your own site.